Easy to assemble, the elevated garden planter from GRO Products is constructed with unfinished Cedar, is pre-drilled, pre-cut, includes all fastening hardware & custom fitted fabric liner. Place custom fitted, heavy duty, landscape fabric into the planter box, add your soil & you are ready to plant your outdoor vegetable, herb, or flower garden. A family owned & operated business, GRO Products manufactures all its quality products in the USA, including raised wooden garden planters, beds & its versatile vertical GRO system (VGS). measures 48"L by 36"w by 34"H.
The Custom fitted liner - a $25.00 value-is made with heavy duty landscape fabric and provides an easy way to keep soil away from the wood. Custom fitted fabric liners-a GRO Products exclusive! 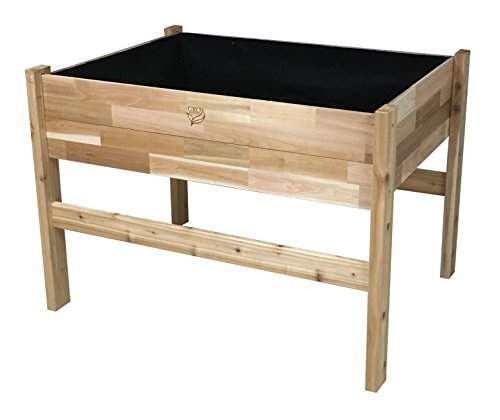 Raised garden planter boxes are made in the USA. Constructed with naturally durable, rot and insect resistant, select tight knot and finger-jointed, unfinished wester Red Cedar wood. Finger-jointed Cedar alleviates the need to always mill solid planks of lumber from standing trees, which helps sustain forests and prevent wood waste. Finger-jointed material combines the clean look of clear Cedar with the varied feel of knotty Cedar.